So, what I love about Tokyo winter? Clear blue skies, dry and crisp air, an occasional sighting of Mt. Fuji in the distance, light snowy days (they're rare), light and fluffy sweaters and scarves, colorful coats, quiet parks with few people, a steaming cup of tea or coffee in the cold morning, and well, a bounty of winter food. We are blessed with an array of fresh produce throughout the year, and while summer boasts colorful, shiny fruits and vegetables, winter brings a vast variety of fresh seafood and fish, along with an excellent lineup of vegetables, even though they may not be as colorful as the summer's. In fact, winter vegetables can be rather somber-looking, often lacking bright color and covered with dirt, which is especially the case with root vegetables. But these rustic, simple fellows have terrific flavors, particularly when cooked - a complex mixture of earthy sweetness and light bitterness, accentuated by a toothy texture. Which makes them wonderful players in winter dishes, such as stews and warm salads. I love them. Although most of the winter veggies can be seen in the store most of the year nowadays, they are at their best right now - available in abundance and cheap. So what's not to love them about? I do! And here are a few of our beloved, familiar veggies in these cold months in Japan - some of them you may know, others not. Negi, or green/spring onions. 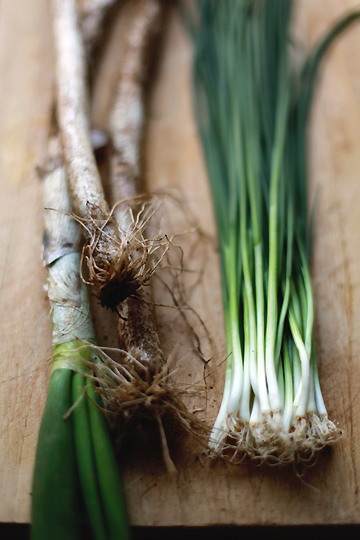 There are a wide variety of negi around, but the most common kind in Tokyo and eastern part of Japan is the one that may look somewhere between leek and spring onions/scallions (picture above: left). Also called naga-negi ("long negi") or nebuka-negi ("rooty" negi), it's mostly used for its tender and stalky white part, while in Kansai region (including Osaka and Kyoto) and western part of the country, those mostly consisting of green, leafy parts are more common. I've just said negi looks somewhere between leek and spring onions, but it also tastes somewhere between the two, too; sweet like leek but with a sharpness of spring onions. 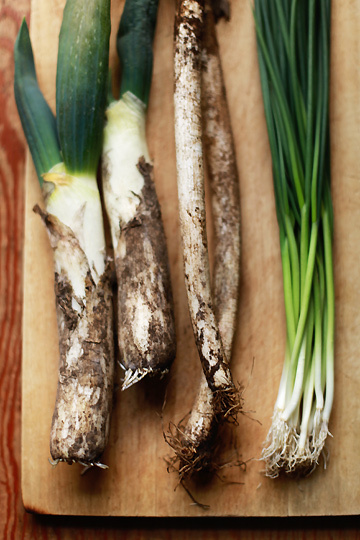 Eaten both raw and cooked, negi is incredibly versatile - you can use them to make a vegetable stock, or have it in all sorts of soups/stews, or mince or slice thinly to use as a garnish. While you can use the common negi in a number of ways, there are other types of negi that have a slightly different character and used for more specific purposes. A distinctively fatter and slightly shorter kind (pictured above: left) is called shimonita-negi, originally from Shimonita area of Gumma Prefecture, just north of Tokyo. It looks and tastes similar to leek - in fact, it is often used in place of leek in the 'Western' cuisine, for leek is not very common in Japan and thus comes pretty pricey. It's used almost always cooked, praised for its mellow sweetness. At the other spectrum of negi are skinny kinds, used mostly uncooked and almost exclusively as a garnish. There are several different types in this category, but one common kind (and that I happened to have at hand when shooting these pictures) is called banno-negi, or "all-purpose negi (pictured above: right)(the name may vary depending on the area/producer). These are more like spring onions, but a lot milder, making a perfect garnish for salads, sashimi, stews, adding flavors without being overpowering. 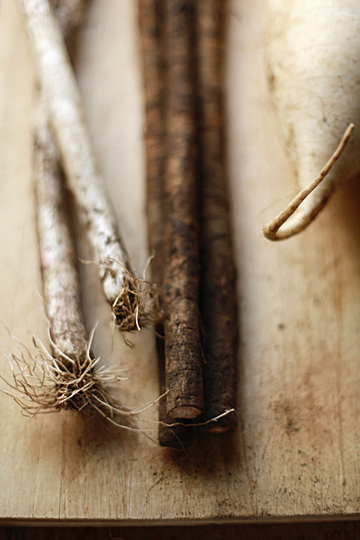 Gobo, or burdock root (pictured above: center). This must be one of the most mistreated Japanese vegetables overseas, mainly thanks to its appearance that may remind you more of a piece of wood than something edible, and perhaps also of its characteristically bitter taste. 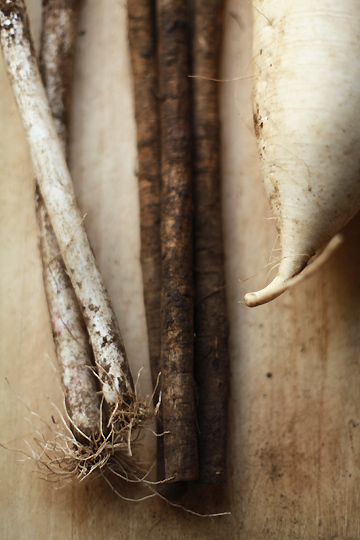 If you've never had it before, think of parsnips, just more earthy and bitter. Well I guess I'm failing to describe the beauty of this rather unremarkable-looking vegetable, and if I'm honest, it's not exactly everyone's favorite vegetable - even in Japan, it can often be neglected, or appointed to a supporting role in a dish. But when treated right, gobo renders a wonderful earthy flavor, making it one of the most common ingredients in winter soups and stews. Sliced into thin matchstick pieces and cooked, it can make a good salad, too. Another root vegetable that probably is more widely known outside of Japan: daikon, or daikon radish (pictured above: right; and below). Far larger than common, round radishes you may be more familiar with, daikon literally means "large root" and has its sharpness characteristic to radish yet is also very sweet, especially when cooked. Sliced and cooked, it makes one of the most common ingredient in soups and stews (I seem to be referring to these two dishes over and over again, but honestly, they are the two most common winter dishes here I think); sliced very thinly and uncooked, it makes a good salad or pickles, much the same way as the small, round radishes do; grated to a fluffy mass, it is used as a garnish to meat and fish dishes, adding a palate-cleansing, refreshing taste. In addition to giving out its own flavors, daikon absorbs the flavor of soups/dressings/condiments extremely well, which is another reason why it is used in a variety of dishes. 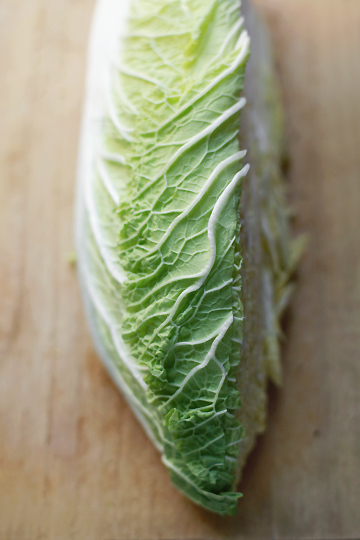 Hakusai, or Chinese/Napa cabbage (pictured above; quartered). 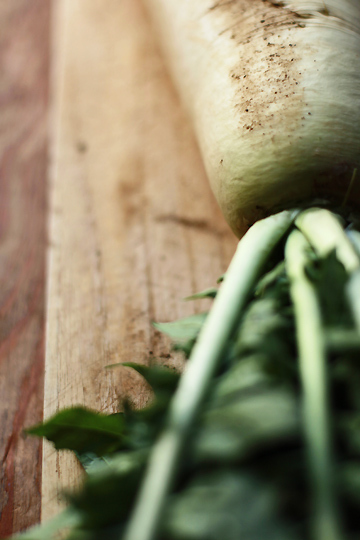 Sweet and versatile, this is probably the most commonly used leaf vegetable in the winter, just like daikon; hakusai absorbs the flavor of cooking liquid really well, too. It can also be eaten raw, often thinly sliced and lightly salted - but really, I think it tastes way better cooked. Mizuna, or... well, mizuna. I believe it is a relatively new name to most of you in North America and even more so in Europe, although it seems to be gaining more popularity these days. In fact, it's relatively new to me, even; growing up, I don't remember eating or seeing mizuna, which was originally produced in Kyoto and its vicinity. While it is now widely available throughout Japan, it certainly wasn't so in, ahem, a couple of decades ago in Tokyo suburbs. 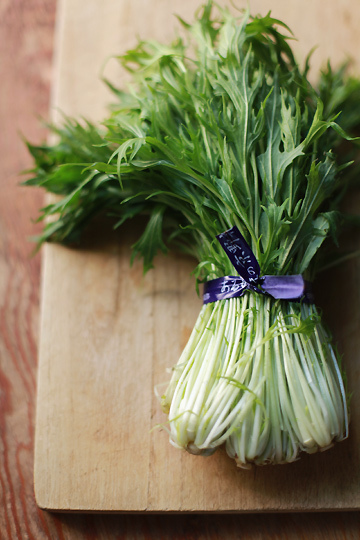 But once I tried it, mizuna quickly became one of my favorite greens to use. Often compared to arugula (rocket) for its peppery, spicy flavor, mizuna is now a popular ingredient in salads, but it is also great cooked, too - although you need to be careful not to overcook it. So what's are all these winter vegetables used in? I know I've said soups and stews more than once, but another equally tasty and popular winter dish here in Japan is nabe, or a hot pot. 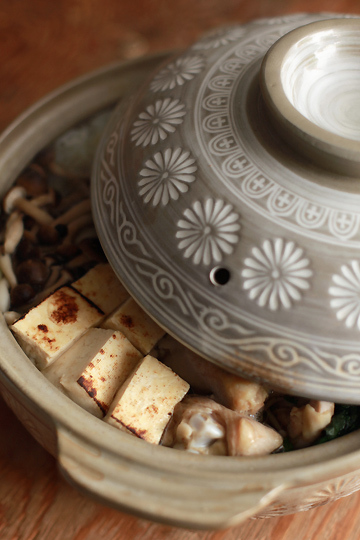 Shabu-shabu and sukiyaki may be the most well-known nabe dishes outside of Japan, and they may be rightly so. 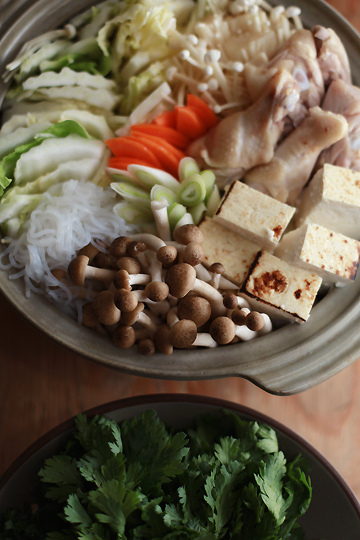 But there is much, much more to Japanese nabe dishes. An ultimate onw-pot dish that's usually easy to prepare and full of flavors, a nabe must be something people eat at least a few times a month or maybe even more than once a week during the winter, either at home or restaurants throughout the country, (well, I haven't asked every person in Japan, obviously, but at least it seems like it). I've been having them more than a few times over the past couple of months, and I'd like to share some of them with you a little more in details - in my next post (I think I've talked long enough for now). Fingers crossed it should come shortly; well, do wish me a luck! * Feb 12 update - the hot pot post is now up here. I love your blog and especially your photos! I have yet to try another nabe other than Sukiyaki. Just wondering, what lens do you use for your Nikon d70? And how do you get that wonderful lighting for each photo? Do you use a specific setting? Aw, now I feel all homesick - I moved from Tokyo to Austria last year and there's not a gobo to be seen...Beautiful photos and thanks for the tips - I'd never heard of the shimonita negi (I thought it said shimoneta at first, hehehe!) Now I'm inspired to pull out my nabe (yes, I dragged it all the way here) and have a dig around to see what I can find here in Europe to put in it. Love how you capture the roots and the stems. hello all, thanks for your comments and kind words! Hanna - i used 35mm/f2 nikkor on my D70. i don't use it any longer as i've recently changed to a canon, but it's a very good lens. i don't do anything particular for lighting - do use a strobe every now and then, but mostly with the natural light. What a lovely pot! I have never tried burdock but sounds unique. Your pictures here are gorgeous too.